When I was a kid my sister and I would go on camping trips with my grandparents before school started. One of my favorite memories from these camping trips was that we would roast marshmallows after breakfast, lunch, and dinner! I was obsessed with marshmallows so this was like a dream come true! Why we were allowed to do this I will never know, but it is a wonderful memory and one that I will never forget! So every year around this time my tastebuds begin to search for the sweet signs of fall in the form of a fire roasted s’mores. The only problem is that fall fires are not always easy to come by – especially when you live in a townhouse. Plus, I often have a tendency to crave a delicious s’mores at the most random and inconvenient times! The solution? S’mores Pops of course! 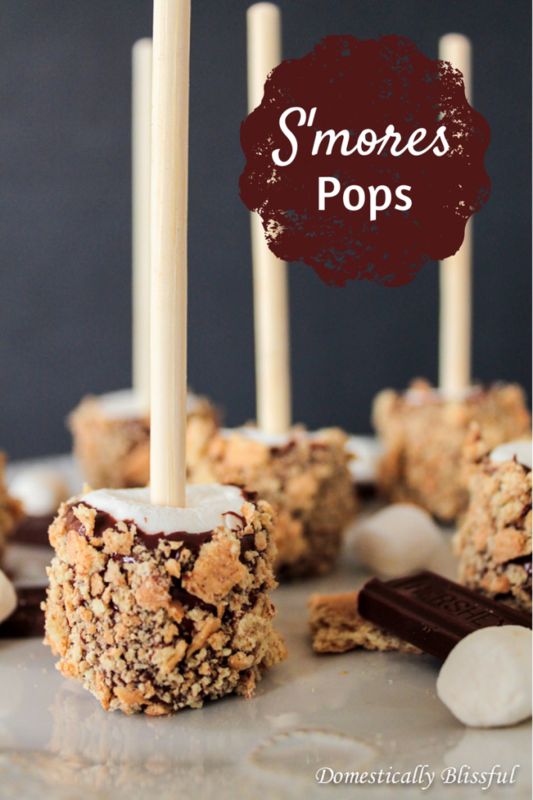 S’mores Pops are quick and easy to make and are the perfect way to enjoy your favorite campfire treat in the comfort of your own home or on the go at work or school! 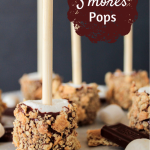 Plus, these S’mores Pops would make a great fall party treat that can be made up ahead of time or made in a classroom as a fun fall edible craft! *Note: Just make sure adults are melting the chocolate – we wouldn’t want any little fingers to get burnt. First, wash and dry the sticks and poke them into the marshmallows. Then crush the graham crackers – I crushed them right in their plastic bag with my hands – and place them on a plate. Next, melt the chocolate. The quickest and easiest way to do this is in a microwave safe bowl in the microwave for 1-2 minutes, stirring it every 30 seconds until melted. 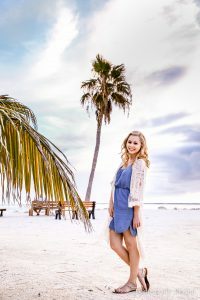 Dip the marshmallow into the chocolate, letting the excess drip off – it helps to wipe some of the extra chocolate off with the back of a spoon – then roll the chocolate covered marshmallow in crushed graham crackers and place it on a plate or baking sheet to dry. 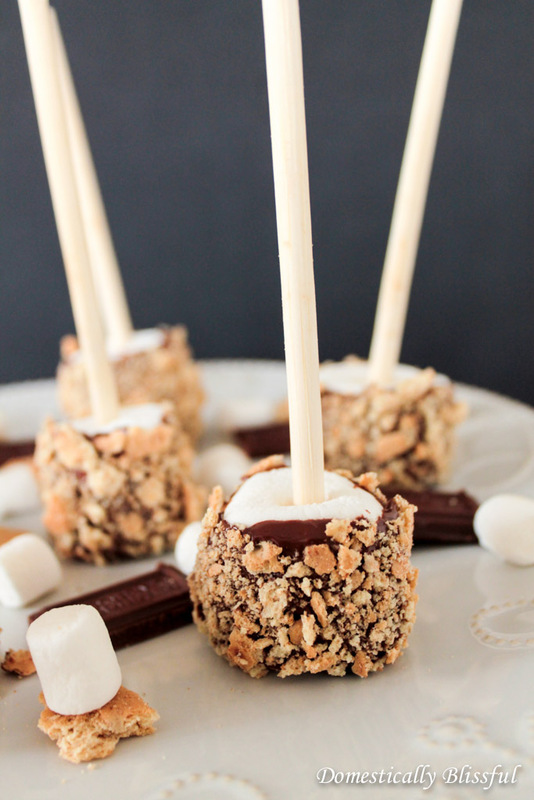 Repeat this process until all of your marshmallows become S’mores Pops. 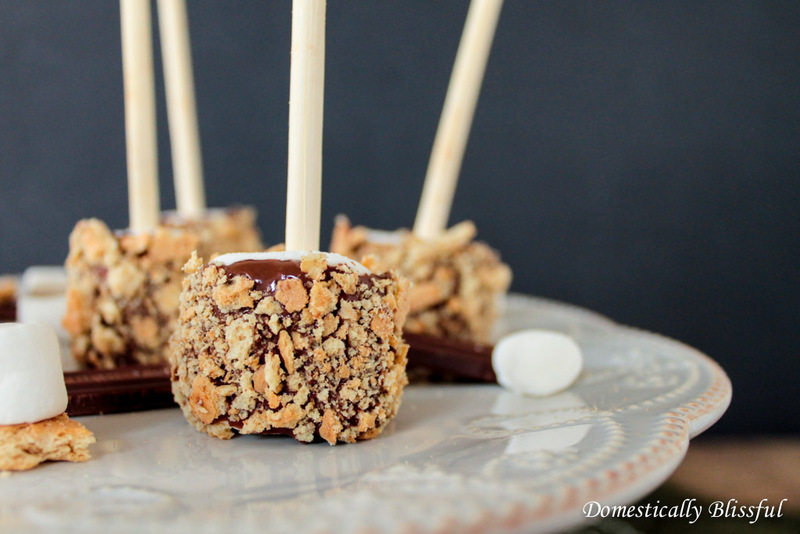 Display your S’mores Pops on a festive fall plate and enjoy! I’d love to see your S’mores Pops! Show off your Domestically Blissful sweet treat on Instagram with the hashtag #DomesticallyBlissful for a chance to be featured on DB’s Instagram! First, wash and dry the sticks and poke them into the marshmallows. Then crush the graham crackers and place them on a plate. 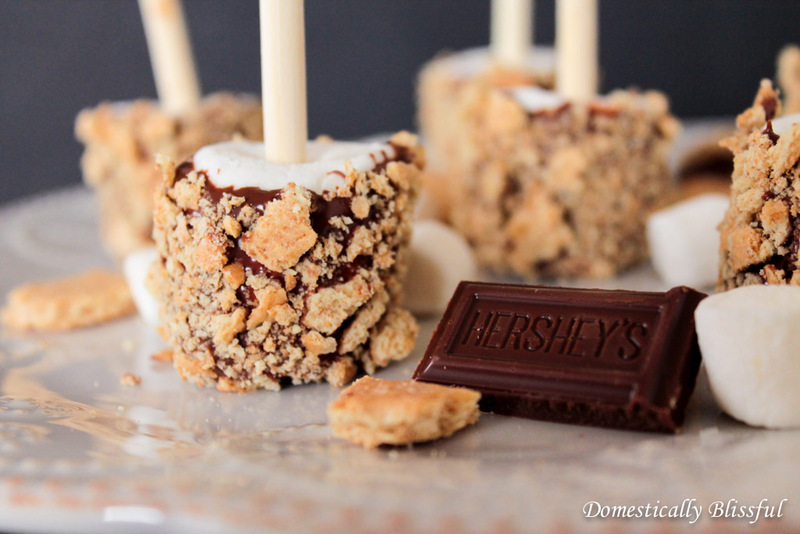 Dip the marshmallow into the chocolate, letting the excess drip off, then roll the chocolate covered marshmallow in crushed graham crackers and place it on a plate or baking sheet to dry. 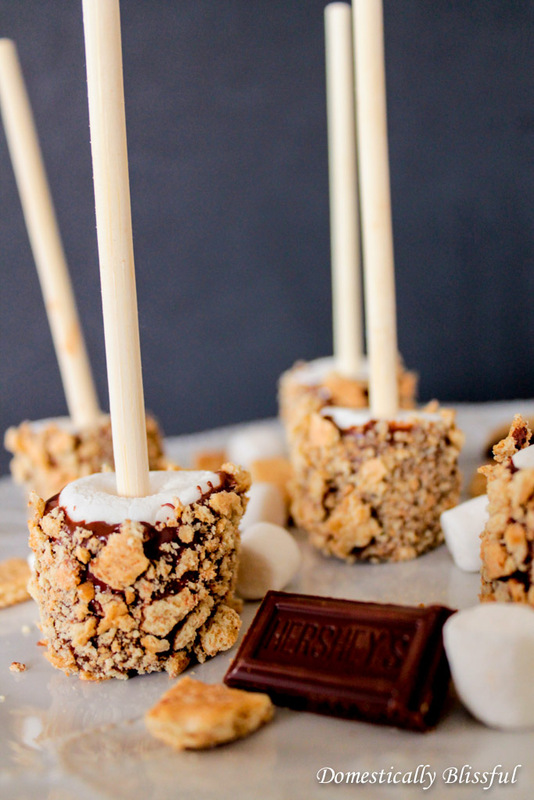 Repeat this process until all of your marshmallows become S’mores Pops. An easy way to crush the graham crackers is right in their plastic bag with your hands. The quickest and easiest way to melt the chocolate is in a microwave safe bowl in the microwave for 1-2 minutes, stirring it every 30 seconds until melted. It helps to wipe some of the extra chocolate off with the back of a spoon before rolling it in the graham crackers.